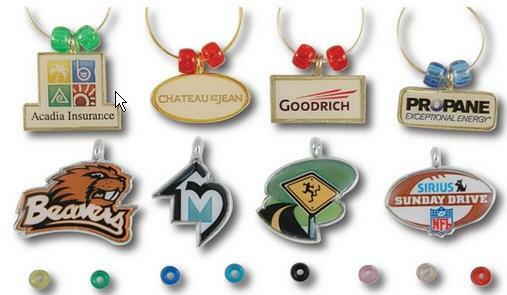 Custom full color imprinted charm up to 1" (largest dimension). Brass finish, stainless steel finish, laminated coating or epoxy dome. Includes charm hoop with two decorative beads per charm. Your choice of 8 bead colors (Black, Dark Blue, Light Blue, Green, Yellow, Red, Pink, Clear). Custom imprinted up to 1". Your design is printed in high resolution full color directly on our specially manufactured acrylic material. We then laser cut the precise outline to create a custom shaped wine charm. 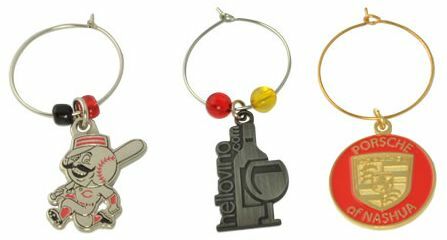 A wine charm hoop in your choice of gold or silver tone is added with one of our 8 stock bead colors. Proudly Made in USA. Individually polybagged. Full metal wine charms, made in USA - ship in 6 days with no setup! 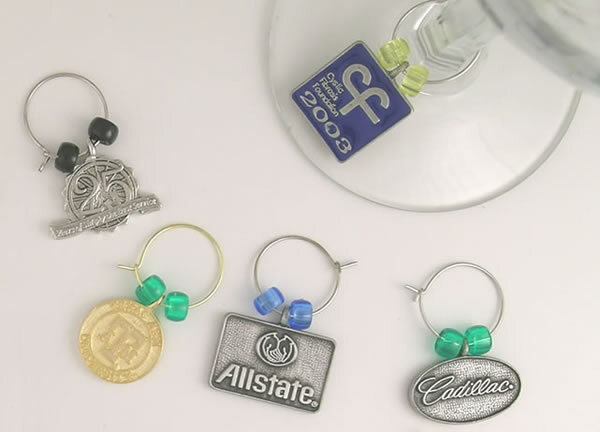 Choose between our 3/4" round or 3/4" square metal wine charms in your choice of brass or stainless steel. Each charm includes a full color imprint and comes with a matching charm hoop and your choice of stock bead colors (8 colors to choose from). Extras: Epoxy Dome: $0.50 each. Custom cast charm up to 1" (largest dimension). Your choice of finishes (Gold, Silver, Hand Satin Antique Brass, Hand Satin Antique Pewter). Includes charm hoop with two decorative beads per charm. Your choice of 8 bead colors (Black, Dark Blue, Light Blue, Green, Yellow, Red, Pink, Clear). Finish: When choosing a finish there are a couple of considerations. First, if your design is done in 3D we'll almost always recommend an antique finish. Antique finishes leave recessed metal areas slightly darker than raised metal. Bright (e.g. gold or silver) finishes don't show 3D details well because the raised and recessed areas are shiny. A hand satin finish is often used in conjunction with an antique finish where there are flat areas on your design. The satin finish provides a brushed look to flat areas. Extras: Color fills $0.40 each. Polished and sandblasted finish $1.20 ea. Back side engraving $60.00 setup - no charge per piece. 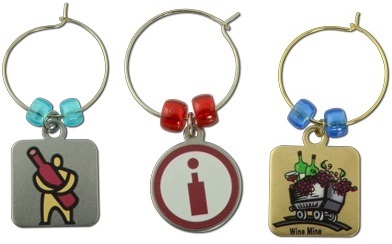 Custom die struck wine charm up to 1" (largest dimension). Includes two colored beads per charm in your choice of gold tone, silver tone antique brass or antique nickel finish and up to 4 soft enamel colors. Individually polybagged. Extras: Color fills $0.10 ea. Polished and sandblasted finish $0.60 ea. Please specify any product(s) and quantity. Get fast reply for review.